That was the question Tuesday as we waited to see whether Nick would go through with moving in with Caroline in "New Girl's" season 1 finale. Jess, Winston and Schmidt weren’t taking the proposed move very well, but despite that, the roomies put up a Craigslist ad for Nick’s room and found some weird guy named Neil. They ended up camping out and jamming to Nick’s old mixtapes. Everyone was having a good time when Nick decided that he wanted to prove to them that he’s making a good decision by moving in with Caroline. So he wandered into the desert to find his keys. Jess went to find Nick, but a coyote approached them, forcing Jess to rely on the most random and adorkable method of defense: saying “meep meep” like the roadrunner. Meanwhile, a super jealous Schmidt, who saw CeCe at a photo shoot in a strange/provocative position with some half naked guy riding a rocket, decided he needed to "white fang" her. Schmidt told CeCe it wasn’t working out and then yelled at her like she was the wild creature in "White Fang." Such a weirdo. I love it! When CeCe realized he was “white-fanging” her (because it’s the only book he has on his Kindle, and he talks about it constantly) she asked why he was pushing her away. Schmidt accidentally admitted to looking through CeCe’s phone, and she told him he has to trust her. His response: “How am I supposed to trust you CeCe? You slept with me; I mean, that doesn’t say much about your taste in men.” Nice. Jess and Nick managed to have a heart-to-heart conversation while the coyote was just hanging out. Jess told Nick he should move in with Caroline if it makes him happy. She then started making “coyote noises” and scared it away with her craziness. Once they returned to civilization, everyone hugged Nick goodbye. Everyone except Schmidt, who grabbed Nick’s face and kissed him on the mouth. I’m going to miss seeing Schmidt every Tuesday at 9 most of all. But later that night, Nick returned! 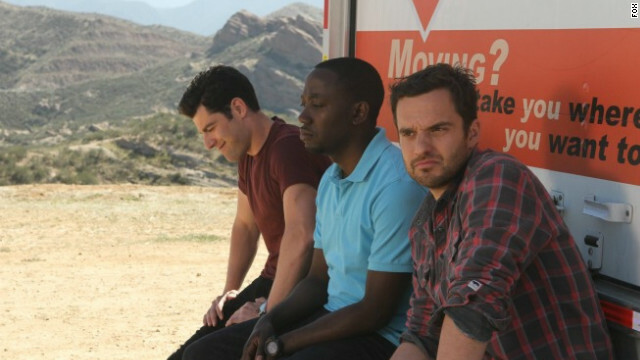 Just because it’s the season finale, doesn’t mean "New Girl" can’t do what it does best: have a happy ending! So the questions for next season: What will happen with Schmidt and CeCe? Will Jess and Nick finally hook up? Will Winston get an interesting story line? We shall see! I like the show, but the tension between Nick and Jess is getting annoying. Jess wasn't making coyote noises. She was making road runner noises. Love Schmidt. I'm gonna miss him. I like all the characters, but Schmidt, Jess, and CeCe make the show for me. @Observer and Skeptic Yet you both are here...reading the article...and commenting. I'm sure you have every episode saved on your DVR. What do you have to say about it, you one of those ppl who just like to think your so kool ? I think schmidt is funny. Love how he 'accidently' looked through phone. I don't think they care what you think. They just say that stuff to get you going. Bet they never watched it. I did, didn't like the show, changed the channel. End of story. The finale was hilarious! Honestly, I couldn't love this show any more than I already do. I literally LIVE for Tuesdays. The entire cast is amazing. Schmidt could have easily become a "Joey" of sorts but instead has me dying laughing to the point where I miss him when he's not in a scene. The Nick and Jess will they/won't they story line is AMAZING and developing at the perfect pace...which is SLOW. The worst thing to do is rush their relationship. The writers are building their friendship first. With that being said, I feel the writers aren't sure what to do with LaMorne Morris' character, "Winston." He's become somewhat of a filler.Damon Wayans, Jr. as "Coach" was awesome. Its sad they lost him to ABC. Lamorne Morris is a good actor snd very funny, he just needs better material. @Observer: finally someone around here I agree with. How about if they just move the whole show...to cancellation.